Ready or not, here comes Christmas. Only two-ish months away. And since Thanksgiving doesn't really have any "songs," there's not a smooth transition from Halloween's Monster Mash into Silent Night. So we get hit with Christmas music in stores starting November 1st, bright and early - if not already. The season of generosity, that's what it is. And it's true what they say: It's better to give than to receive. Right? Well sadly, according to this past weekend, I have a long way to go. So there we were at the Beth Moore women's conference in Long Beach - 9,000 of us. (I did the math, and that's 9,000 pairs of tall equestrian-style boots and brightly-colored skinny jeans that I saw.) The whole thing was amazing. The way that woman communicates the Word of God, bringing it to present-day life, in her Southern drawl. I'm pretty sure I'm wiser now - except for that one thing. It was near the end. After the last song. The worship leader shared something with us. Something God put on his heart about his praise team becoming a gathering of givers. And I got so excited. What were we going to get exactly? Surely not a car. Too many of us. iPads? Of course not. Hmmm, what could it be? So excited. Just like on Ellen! And when he explained "gathering of givers," I've never been so happy that I kept my thoughts to myself. For what he meant was that we, the audience, are the givers. Oh man. How could I have missed something so obvious? "Me. Me. Me." that's all I heard. 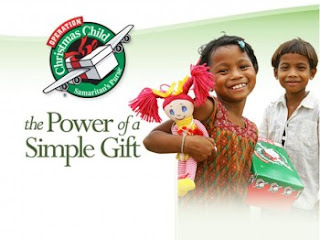 As the worship leader began telling us about a giving opportunity through Samaritan's Purse - a Christmas shoe box ministry that blesses kids around the world - I felt ashamed. But right then and there, the whole theme to Beth Moore's message played-out in my heart. She told us about King Naaman in 2 Kings 5:1. "Clamin' Naaman," she said. And how he was a great man in the sight of his master and a highly regarded man of valor, but - a big BUT - he was a leper. Now, fast forward to, well... ME. (Apparently my favorite subject.) What is my personal "leprosy?" My one blight? Am I afraid to be generous? Am I too thrifty, to the point of being stingy? Could be. I'm just glad God loves me enough to point all that out to me. So as the Christmas season quickly approaches, I'd like to say goodbye to Miserly Molly and hello to... Moody Molly? Hope not. Magical Molly? Doesn't fit. Magnanimous Molly? Too big of a word. How about simple, yet festive, Merry Molly? Sure. And what about filling Christmas shoe boxes with Bonne Bell lipgloss, fuzzy socks, and Play-doh? If it were up to me, I'd like this year's Samaritan's Purse shoe box to be big - tall equestrian boot-sized big - and filled to the brim.